Ahh Wednesday you beauty. What a week it's been, I'm glad it's nearly over! Regular readers here may remember I got excited about Muscat Daily's story about Melamine last year on October 10th. I blogged about this on the October 17th here, and followed it up on December 10th here. 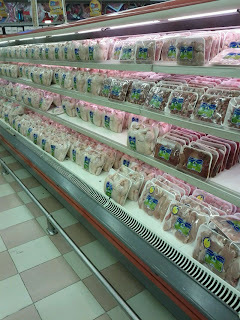 An example of Poultry products available in Oman. I'm not saying this particular brand is safe or unsafe to eat, it was just simply the poultry section in a local supermarket - that's all. 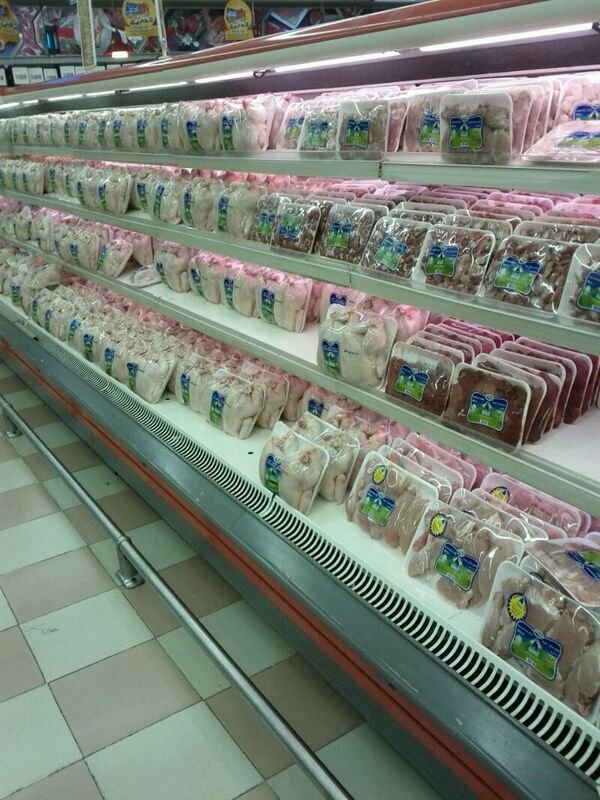 Muscat Daily reported that an SQU study into meats available for purchase here in the Sultanate indicated some meat products contained massive concentrations of Melamine, yet declined to report exactly which products were contaminated. The reason for this failure to report the brands affected was because the Ministry of Health declined to provide this information. Reference is made to your below email regarding Melamine in local meats, please note that we have forwarded your concern to the Director General of Health Affairs, Ministry of Health. Unfortunately we have not received any reply till now. Please note that we will send you the answer as soon as we receive it. A follow up email was then sent back to the WHO Rep on 2nd January 2012, and again February 4th with no response to date. So, the melamine issue still rumbles on. What we have learned so far is that the Director General of Health Affairs, Ministry of Health is obviously a very busy person indeed, being unable to give an answer to a single question asked of him or her (I dont know who the DG of Health Affairs is) in October 2011 until the end of February 2012 so far. One might suggest that the Ministry of Health simply dont care about this issue and have decided that perhaps they'll just ignore the request for information in the hopes that it'll all blow over. Which raises even more alarming questions! What if the slowness to respond is less rooted in the "too busy / don't care" pile and more rooted in the "Omani producers will get hurt so I'll stay mum about this" pile. This is a classic example of how NOT to manage your Public Relations. Here's a top tip: If the national press write a story about the potentially lethal levels of contaminants in foods available for purchase in the country, perhaps you should issue a statement so that citizens living here know what is safe to eat. Could you imagine the press reaction in, lets say for comparative purposes, China, if Melamine levels as high as reported here were found in local food products and the Ministry of Health failed to give a statement? In China, as a result of the Melamine in milk scandal which broke in July 2008, a number of criminal prosecutions occurred, with two people being executed, another given a suspended death penalty, three others received life imprisonment, two received 15-year jail terms, and seven local government officials, as well as the Director of the Administration of Quality Supervision, Inspection and Quarantine (AQSIQ) were fired or forced to resign. Meanwhile, here in Oman, the DG of Health Affairs is too busy to even answer the question of what meat products are contaminated so we can avoid these products. Let's not forget that the question asked to the DG of Health Affairs was asked by the World Health Organization, not Joe Public. Why is the WHO failing to follow this up to get an answer? Why is the National Press not reporting on this to force a response? Why is the Ministry of Health ignoring this? I sincerely hope that the SQU report first reported on by Muscat Daily was flawed or incorrect, and this is all a storm in a tea cup - and if that is the case, then TELL US! If it's actually the case that this melamine contamination is as reported in the SQU findings, then what on earth are the Ministry of Health playing at? I doubt we'll ever hear anything, but I hope my rant helps spur some sort of positive reaction, instead of landing me in hot water with Al Plod for bringing this up again. The study was a furfy. Melamine is only f'ed to cows to boost the appearance of protein in MILK. As in China. That's it. No doubt questions made to the govt should be answered, but there's nothing to answer. The SQU study (unfounded as in no refs cited) was in the context of promoting chicken ... Get it? A blackwash of meat. Stop worrying and get on with playing rugby. Chicken can get melamine from adulterated feed, where the stuff is added to boost protein measurements. If Oman (or the place that grew the chicken overseas) used dodgy Chinese feed, or feed with some originally Chinese additives like Gluten, that could cause problems. Anonymous, this furfy (as you call it - you Australian?) was generated by the Dept. of Animal and Veterinary Sciences when they tested 51 meat samples, from 35 local and overseas producers, and found that only the chicken showed a melamine problem. A blackwash of meat? That means something? You suggesting that they rigged the results for personal gain or that they are incompetent? Dragon, that is exactly what they implied in the report. Quote "These results indicated that some of the poultry companies may have used feeds contaminated with melamine" Unquote. Something stinks here - and it may not just be the rotting meat. I've asked a few of the cooks at interior work installations that I frequent and they report that the chicken they use is from outside Oman. melamine is prevalent in gay chickens ONLY. Typical zionist scare tactics. Ostrich beef is a tasty and delicious heterosexual alternative. LOL @ some of the comments. I personally like to buy my meat fresh from the farm (besides imported Saudi frozen chicken---who knows how iffy that is?) and then take it to the butcher. You can usually tell how healthy the feed is by the price of the animal. For example, a cow from Jebel Akdhar is going to cost more than one fed imported feed as it eats local grass, same with alot of the bulls in Barka. If you are truly worried, why not invest in a good freezer and buy in bulk or go in with some friends and split a cow the way Omani families do? We do this with goat, lamb, and beef. I really should get my own chicken but I don't like the stink they make and so just end up buying the frozen Safa (KSA import) stuff. ostrich "beef"? A good alternative for you could be bull testicles; I hear they 'taste like chicken'!